A hot air balloon flight gift voucher, an unforgettable gift for all special occasions. Birthdays, Christmas gift voucher, Valentine’s Day, weddings and anniversaries or as a spur of the moment romantic thought for somebody special. Looking for the best gift to say thanks to your staff? A great staff incentive, treat your staff or working team with a special thank-you for that job well done. Ballooning is great for a team-building exercise. 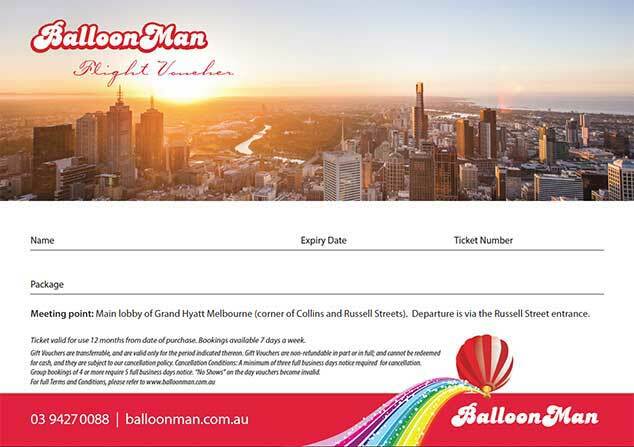 Your Balloon Flights Over Melbourne flight voucher can be sent to you in the mail same day or you are welcome to purchase and download the flight voucher right now. Balloon Flights Over Melbourne flight vouchers are valid for twelve months. Vouchers entitle their lucky recipients to a magnificent balloon ride over Melbourne and delicious breakfast at Grand Hyatt Melbourne. All passengers receive a post flight certificate to recognise their daring in joining us on a hot air balloon flight over Melbourne. The choice is yours, nominate a day in advance or leave the voucher open dated. Recipients of gift vouchers simply need to contact our office on 1800 HOT AIR (1800 467 247) or 03 9427 0088 to arrange a convenient day to take their hot air balloon ride over Melbourne. Group discounts are available for groups of 6 or more passengers, please ask for a quote. Balloon Flights Over Melbourne accept Visa, Mastercard, cash, cheque, mail order, eftpos and travellers cheques.